I want to be able to create a selection that when the field is used the form will automatically trigger a condition without having to click the "next" button. Not like a show condition but more like being able to send the user to the end of the form or another URL at the moment they have made their choice. Obviously it would be a radio field and I would hide the page break. It's more a case of style than necessity. In my case I'd like the user to go to the end of the form if they have not the credentials they need to complete the form from a particular point. By making the selection they would be instantly whisked away to the end of the form. This functionality is already in JotForm. 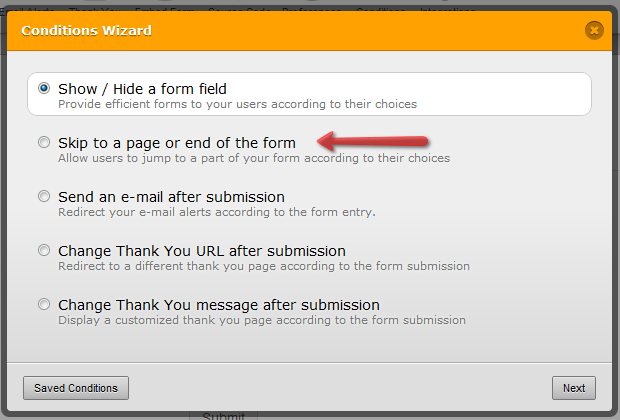 If you check on the condition wizard in setup & embed/conditions the capability to skip to the end of a page in form is available. Please inform us if you have further inquiry. Just to confirm, will this allow the condition to be activated without having to click the "next" button. What I mean is that as soon as the option is selected that the user is directed at that time and not having to wait for them to click the "next" button? The validation happens when the click to the next button is initiated. So you the look-up happens at the time the next button gets clicked.